When she reaches her 16th birthday, Himari Momochi learns that she has inherited an old house located deep in the woods. She has never seen this domicile, which is called the Momochi House, and does not know that it already has three inhabitants. One of them, 17-year-old Aoi Nanamori, is the “Nue,” the “Demon Prince” of Momochi House, which acts as a barrier between the human world and the spiritual realms. The Demon Prince of Momochi House, Vol. 10 (Chapters 36 to 38) opens and Himari wonders how Aoi really feels about her. The two have grown closer, and Himari wonders if Aoi's recent words, with their romantic leanings, are genuine. She believes that she needs to know more about the previous “Nue” before Aoi. Now that it is summer break from school, Himari decides to explore Momochi House. When a crafty ayakashi attacks, the “Guardian of the Gate” suddenly appears, and he wants to do more than just protect Himari. 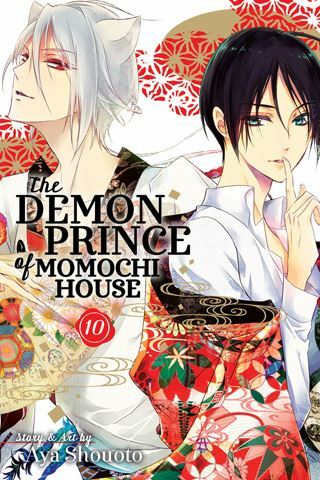 THE LOWDOWN: I think of The Demon Prince of Momochi House manga as being one of those manga and fantasy comic books that are filled with a genuine sense of the supernatural. Every page is infused with a magic and with ayakashi (yokai). The Demon Prince of Momochi House Graphic Novel Volume 10 focuses on a buddy romance and on an interloper. Creator Aya Shouoto sets the stage for a love triangle; after all, this is a shojo manga. However, the part I like best is the ayakashi attack. I think Shouoto is as good with supernatural fantasy as she is with spinning teen romance. I READS YOU RECOMMENDS: Fans of high school-age supernatural romance and of yokai fiction will want to visit the “Shojo Beat” title, The Demon Prince of Momochi House.